The Gert Sibande region has a 38.4% unemployment rate. The number of unemployed graduates in the region continues to escalate. However, unemployment is a countrywide problem. Gert Sibande TVET College Centre for Entrepreneurship Rapid Incubator (CfE/RI) will bring enterprise development agencies closer to young entrepreneurs and communities with limited- to no access, to small enterprise development services. These much-needed services and support services, will be made accessible to young people in particular. Gert Sibande TVET College Skills Academy and Artisan Development Centre apprentices, are amongst the beneficiaries of the services and support programmes offered by the Centre. Mafarafara Electrical and Fitting Trade Enterprise was one of the companies established under the guidance and support of the CfE/RI. It was established on 17 November 2016 after the college signed a Memorandum of Understanding (MoU) with MerSETA to incubate 30 engineering graduates from the college for a period of 18 months. The programme officially began on the 2nd of November 2016 and consisted of three phases of incubation for the 30 participating students. Six graduates, Martin Bafedile (42), Glenn Mojalefa (25), Cavin Mohlala (30), Rebotile Mabilu (35), Happy Mashau (25), and Paledi Mohlala (30) are all from poor backgrounds. They are destined to create a sustainable enterprise through Mafarafara Electrical and Fitting Trade Enterprise that will positively contribute to financial freedom. They all joined the programme by chance when they applied for an apprenticeship that was offered by the College’s Skills Academy and Artisan Development Centre. These apprentices of the College said the main purpose of starting a business together was to improve their standard of living and to create employment opportunities for their peers. “We want to leave a legacy for future generations. We want to set an example to young people that it is possible to be something even if you come from nowhere,” said Martin. Martin Bafedile is the eldest member of the group and he works as a welder. He completed his matricin 1994 and got a learnership to study tourism with the hope that he will get employment after obtaining his NQF Level 4 qualification. The universe had its own plans because he ended up working as an operator at a local mine. He then worked as a ranger in the Kruger National Park. In 2011, he applied for an apprenticeship at the Skills Academy and Artisan Development Centre. He graduated in 2015 as a qualified artisan welder. Glenn Mojalefa is an aluminium welder, Human Resource Manager and an innovator networker in the business. 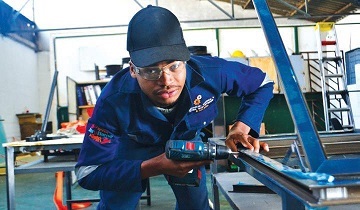 He graduated with Gert Sibande TVET College, Evander Campus in 2015 with an NQF Level 4 in Mechanical engineering and further enrolled for the Nated Mechanical Engineering programme. He did not complete his Nated qualification because he was accepted to join an apprenticeship programme in which he was successful. Cavin Mohlala is an electrician in the business. He always wanted to be an electrician, but ended up enrolling for Civil Engineering and Building Construction at Mopani South East TVET College because the Electrical Engineering classes were full. He did not complete his Civil Engineering qualification because he was accepted to join an Electrical Apprenticeship programme offered by the Skills Academy and Artisan Development Centre in the College. He joined the programme in 2011 and graduated as a qualified artisan in 2015. His future plans include opening his own company on the side. “I want to see myself running a successful company and through hard work and dedication, anything is possible,” said the determined Cavin. Rebotile Mabilu, a female member of the business, is also an Artisan Welder. She enrolled for Civil Engineering and Building Construction at Ehlanzeni TVET College in 2009. She left the programme in 2010 and joined an Apprenticeship programme that was offered by the College Skills Academy and Artisan Development Centre. The apprenticeship in construction was over an 18 month period. She graduated as an artisan welder in 2015. She then applied and was accepted to join the CfE/RI programme and was introduced to her business partners. 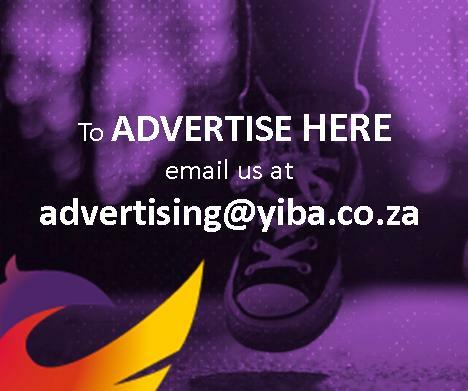 Happy Mashau, is a passionate administrator in the business. She graduated from the College with Engineering andRelated Design at Evander Campus. She is a strong proponent of the importance of education. “Education is a ticket that can take one out of poverty and can pave a way to success,” she alluded. She graduated in 2016. Paledi Mohlala, an electrician, marketer and a safety manager in the business, shares the same sentiments with Happy. His plans after completing matric were to become a Programme Technician. Due to financial difficulties, he secured a bursary and enrolled for Electrical Engineering at Nkangala TVET College in 2008. He registered for Electrical Engineering and he only completed levels 1, 2 and failed to complete his Level 3. He then applied for an Apprenticeship at the College Skills Academy and Artisan and Development Centre where he graduated in 2015. His advice to young people is “embark on business for self-reliance because dedication and commitment is the only way to financial freedom. ”The dedication and commitment of these young people is impressive. Their shared background is reflected through their dedication and commitment to take the business to greater heights. They recently invested in one of their partners, Glenn who they sent for aluminium welding training with Wispeco Aluminium. The training took two weeks to complete. “The training with Wispeco aluminium helped us a lot because we have added another service that will bring cash flow to the business,” said Glenn. Gert Sibande TVET College Centre for Entrepreneurship Rapid Incubator, supported by the Small Enterprise Development Agency (SEDA), provides support to these young entrepreneurs to ensure a profitable business.